For this week, I wanted to stay away from politics, war and current events. Instead, I decided to focus more on the culture of Congo, specifically the cuisine. While Congolese cuisine widely differs from region to region, the majority of their food reflects the indigenous culture. One staple is called cassava. 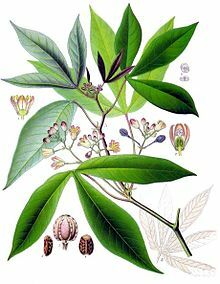 Cassava is a plant known for its edible root. The root is full of carbohydrates and provides the third-largest source of food in the tropics (Wikipedia). 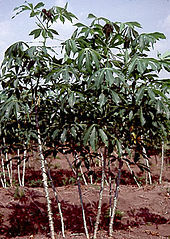 Nigeria is the world’s largest producer of cassava. While cassava is rich in carbohydrates, it lacks protein. Those who have tasted the root classify it as sweet or bitter depending on how it is prepared prior to consumption. The leaves of the plant are often mixed with rice and beans. Frequently, a Congolese meal consists of a starch ingredient, such as cassava, along with vegetables and occasionally meat. The meal is typically a stew with the sides and main dish all mixed together. One interesting piece of information I found is the lack of meat Congolese cuisine uses. The act of being a vegetarian is unknown in Congo, yet most meals are eaten without meat due the high price of meat. (Wikipedia). When meat is consumed, goat is the most widely eaten meat. I also read sometimes insects are consumed. Most commonly are grasshoppers and caterpillars. Both insects are noted to have a nutty flavor (Wikipedia).